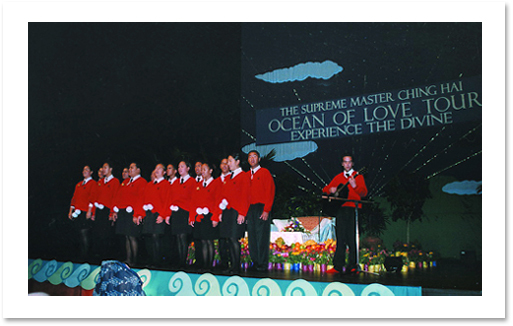 On April 27, 2000, responding to the intense longing of many sincere souls, our beloved Master finally graced the Land of Long White Clouds -- New Zealand. (Note: the Maoris, the native people of New Zealand, call their country Aotearoa, which means 'Land of Long White Clouds'). The venue for the lecture was the Aotea Center in Auckland, a popular site in New Zealand for international conferences and performances. Fellow practitioners exquisitely decorated the huge stage using a beautiful background that consisted of a blue sky and white clouds. The edge of the stage looked like waves moving in a blue sea. The green mountains and trees on stage created a warm and natural feeling, while the brilliant sunrise in the middle perfectly matched the infinite radiance of our loving Master. The Auckland lecture program began at 7:00 PM, and the several thousand seats were soon occupied by an earnest audience waiting for The Supreme Master Ching Hai to talk about how to experience the divine realm of heaven. That night, Master wore a striking short-sleeved dress suit with a long, close fitting skirt in light pink, decorated with tiny blue and purple flowers. She wore Her hair with two short plaits hanging down from Her temples, which added to Her gorgeous and dignified appearance. While fellow initiates were sharing their personal experiences with the audience, a group of Maori people outside the venue performed a traditional Powhiri ceremony to welcome Master to New Zealand. A Powhiri is more than just a welcome; it is an acknowledgement of the dimensions of spiritual, physical and mental wellness. This introduced Master for the first time to Maori customs, which are an important part of New Zealand's heritage and Maori life. 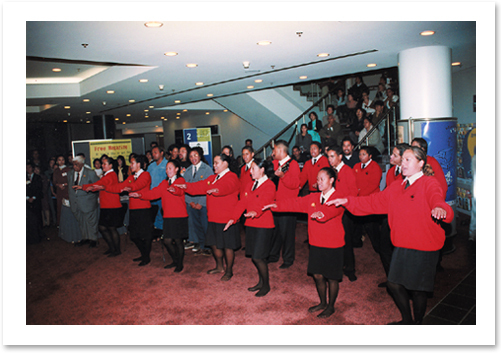 A group of Maori people performs a traditional Powhiri ceremony to welcome Master to New Zealand. A Powhiri is a way of life to the Maori people. On a physical level, the physical presence of the person being welcomed is acknowledged. In that acknowledgement, reference is made to the essence of the spiritual dimension of those who have died in the year, the month, the week and the day belonging to the person whom you are welcoming, and in particular, Manuhiri Tuarangi (those who have traveled across the seas). Reference is also made to the essence of the rivers and mountains, which joins with the essence of those Tangatawhenua (native peoples of New Zealand) who have passed over. The physical presence of the person being welcomed is a visual representation of the physical and mental dimensions. The Powhiri was led by the Kaumatua(first right)with Naida Glavish(first left)as interpreter. A "Kaumatua", the Maori Leader, welcomed Master to our shores, thanking the Creator for the safety of Her journey, while verbally connecting all the different aspects of the "Powhiri". On this occasion, the "Kaumatua" was also a spiritual leader of the Maori. He then thanked Her for the tremendous work that She is doing for the higher good of all people. 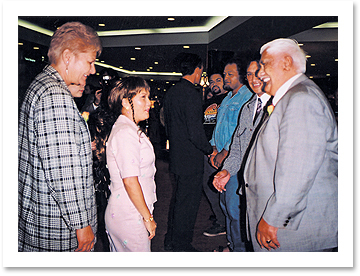 He said that as Tangatawhenua we have a responsibility and accountability to our people to Manaaki (embrace and host the Master with the reverence She deserves), and finished his speech by calling on the Creator and the holy angels to bless Her and Her stay in New Zealand, and to continue to support Her in Her journey. Next, a "waiata" (song) about the gentleness and beauty of the female energy was sung by the Hato Petera (St. Peter's) Culture Group. The second waiata was a welcome to the shores of Aotearoa (New Zealand). Master was then given a "hongi" (a pressing of the nostrils and forehead or third eye area together, thus sharing the breath of the spiritual life force on all levels). This is a sacred greeting of the Maori given to those considered to be friends. Master then proceeded to give a hongi to everyone in the Culture Group. Master was very moved by the ritual and remarked, "The welcoming ceremony and songs touch a person's heart." She also said that She could feel the strong spiritual tradition of the Maori people. Affirming Master's words, a newly initiated Maori sister later said to us, "The Maoris traditionally live a life emphasizing spirituality more than material aspects. The Maori race is like a sleeping giant in a half-awakened state waiting for someone to wake him up." She deeply believed that Supreme Master Ching Hai was the Saint who had come to awaken the giant to the Light. In the words of the interpreter, Naida Glavish, "Master is absolutely dynamic and non-assuming, and has and portrays the Truth, something that is missing in this world. She has no fear, is extremely sensitive and picked up on the spiritual aura of the Powhiri. She is a powerful female energy that does not undermine male energy to sustain Her power." Later, the Kamatua who greeted Master, stated that he felt very honored to be in Her presence. Following the Powhiri, Master entered the hall to the surprise of the New Zealand audience, and quietly walked down the aisle, and with a gentle touch and a beautiful, loving smile, acknowledged the outstretched hands that welcomed Her. The first was about the unity of male and female. The second was youth acknowledging the wisdom of their elders, while the third dance signified the young generation's acceptance of the Maori language as being a "taonga" (heirloom or treasure) that is handed down verbally from generation to generation from their ancestors and is worthy of nurturing. Master was then invited onto the stage, where She greeted the New Zealand audience with a traditional Maori greeting, "Tena Koutou", (Greetings to you all) and then thanked everyone for welcoming Her to New Zealand. In Her speech, Master said: "I think you know why you are here. Everyone wants to know what God is and where we are from, and that's the reason why we came to this physical planet. Even though at the same time we are connected with heaven and spiritual planets, but because we have forgotten the connection, most of us just recognize this physical life. In fact, we are not just humans; we are highly developed beings. Like the Maori traditional songs we have just heard -- these songs are spiritually developed, highly elevated, because ancestors of the Maoris have known a different world of the spiritual. We can remember it again, because what we once had we never lose." Master continued by giving an example. We are the whole being, not just a toe, a finger, or a forehead. Similarly, if we just remember that we are a physical being, then we are not complete. She said that She was there with the honor of God's permission to remind everyone that they should remember their whole being. It is just like because we like this ring so much (Master shows Her ring) and we keep looking at the ring, we will just remember this finger all the time and forget ourselves. Actually, the spiritual wealth is always there, but it is just that we are too busy looking outside and remember only our physical being, so we forget the other 99% of our being which is higher, greater, more powerful, more miraculous, more wondrous, more holy, more divine, more beautiful, happy, blessed and blissful. Master went on to say that we are temples of God, but we have forgotten our God quality. That's why we say enlightenment is "immediate", because it is already there. "It's very simple," Master pointed out, "you are already divine. I am here just to remind you to remember. God lives within you. So, you are God. Otherwise, who is God? Therefore, no matter what people choose to do, do not judge them. They chose a different way to know God. One day they will know they are God in their own way." Finally, Master said that She could help us only when we are ready. Otherwise, no one can do anything much. Master asked the audience members whether they wanted to have a glimpse of heaven, and everyone earnestly answered, "Yes!" Master then taught them how to practice the Convenient Method and many people had visions of inner Light, or the sun, and thus experienced an initial taste of communicating with God. Afterwards, Master answered a great variety of questions, advising one person who still hesitated about following the Five Precepts that God is the first priority. We should make up our mind to do anything to know God, to live a life of not killing sentient beings, live a life of not stealing, live a life with no sexual misconduct, and live a life of not telling lies, live a life without drugs and alcohol. We present ourselves as the being we want to represent. Whether we want to present ourselves as enlightened beings is our choice. With respect to the vegetarian diet, Master explained that animal energy is very heavy because they love life and fear death. She also said that all lives are actually one. When we hurt other sentient beings, we are truly hurting ourselves. Suppose we have our finger incised; although our nerves are not hurt, it is still true that we have hurt ourselves. After the lecture, Master personally distributed the fruits and flowers on the stage to the audience. Everyone was extremely happy and reluctant to leave. Except those who had to go register for initiation, most people loitered around the exhibition area where Master's artwork, Celestial Clothes, Celestial Jewelry, paintings and Longevity Lamps were displayed. The crowd did not disperse until very late. A fellow sister from Auckland shared her story of getting initiation and embarking on spiritual practice. Since she was a young girl, she had asked herself, "Why do people come into this world?" and "Why do people have to suffer so much?" Although she believed in God, she could not find God within her, nor did she know where to find God. Gradually, her only way out was to become intoxicated through the use of drugs and alcohol, with only the illusion of happiness. At this fateful crossroads in her life, she was led to participate in social work. Incidentally, she read the news of a local spiritual exhibition in the newspaper, and subsequently encountered Master's teachings. "Sneaking by, I took a sample booklet, and something came over me instantly". So she rushed home and read the book carefully. Although she promptly learned the Convenient Method, she knew that it was not enough. She just could not let this once-in-a-lifetime, or maybe once-in-a-million-eons opportunity pass her by. Her life since her initiation has been full of happiness, yet as a human being she still has had to face many challenges. However, she has found that they can be easily overcome through the power of the inner Light and Sound that she experiences in meditation. The Quan Yin Method has brought great happiness, joy and inspiration into her life and she usually has a great deal of energy. This helps her social work career as well. Her sleeping soul has been awakened, and she now looks through very different and clearer eyes. She was happy to share with everyone her wonderful experiences, telling us how honored we should feel to be in the presence of a true living Master, Supreme Master Ching Hai, Who has the key to help them find the Truth within, which is their birthright. A Maori sister, who had been initiated for just a month, told us that she once regarded Master's sample booklet as worthless. But later, because her older sister practiced the Quan Yin Method and had changed incredibly, she was inspired to explore Master's teachings again, and so didn't miss this treasure. Now, her parents, both of whom are over eighty, are practicing the Convenient Method. In studying Master's teachings, what struck her most was Master's statement, "We are the Light, but life ties us up with money problems, work, and information, so that we become engulfed by these problems." Master teaches us that we have to look within to know who the boss is -- and what we need to do. Master's teachings have encouraged her to understand that enlightenment is our true Nature, and that we always have it. Master has also said that if we have a way to recognize it, it will always be there. The thing this sister really loves most is that Master will always be there for us, and that once connected with Her we will always be connected, no matter where She is in the world. Fellow initiates were overcome with excitement when they learned that Master had accepted their invitation to give a lecture in New Zealand, and immediately launched a program of preparatory work. All New Zealand practitioners benefited immensely from this process, which was both enjoyable and fulfilling. The majority of New Zealand fellow practitioners live in Auckland, on the North Island, with only a few scattered through other parts of the country. However, to spread the good news of Master's lecture to every corner of the land, each did his or her best. For example, one fellow sister living on the South Island drove all the way from Dunedin at the southernmost end of the Island to Christchurch at the northern end. While driving, her only thought was: "When the Lord comes again, the gospel shall be spread to far off lands." In some remote small towns on the South Island, she left just a few flyers. But when she saw the local shopkeepers taking up the flyers and reading them attentively, she was very moved. Several other fellow initiates living in Taranaki, in the southern part of the North Island, also drove north sowing Quan Yin seeds along the way, which they hoped would sprout and help people lean toward Master's divine Light. Their destination was Auckland, where they joined the preparatory work for the lecture. Hamilton City is just one and a half hour's drive from the venue where the lecture was to be held. Apart from holding video seminars and sharing the news in the local downtown area and university, fellow initiates also put up posters and distributed flyers in the adjacent smaller towns. Many people were immediately overwhelmed by heavenly bliss upon first encountering Master's teachings. Consequently, a woman from Indonesia learned the Convenient Method and requested that the Center send sample booklets to her old friends in Indonesia. Another lady had received a copy of the sample booklet years earlier. This time, she was really delighted and determined to grasp the opportunity to get initiation. She even encouraged other people who had not followed Master to break through and overcome their worries about keeping a vegetarian diet and the daily meditation practice schedule. She informed them that they definitely could make it if they had enough determination. Before fellow initiates poured into Auckland from around the country and abroad, local initiates had already done much preliminary work. Without exception, everyone who participated learned a great deal from the process. Since it is illegal to put up posters randomly in New Zealand, fellow initiates had to approach the manager of each shop they visited to obtain permission. On the first day, many initiates were embarrassed and not used to doing this kind of work, so the results were not very good. However, after attending a group meditation session, they realized that their thinking and willpower had not been firm and positive enough. The more they feared being refused, the worse the results would be. Beginning with the second day, their work attitude and thinking became more positive, and thus their results were more impressive. Finally, the posters were all put up before the scheduled time! All the fellow practitioners involved in working on Master's New Zealand lecture contributed their utmost effort to the project, thus helping to convey the good news of Master's visit to all the longing souls in the area. 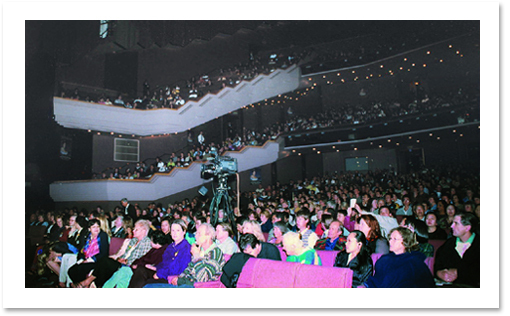 Several thousand seats in Auckland's Aotea Center were filled for the lecture, and many people stayed afterwards to receive initiation and join the Quan Yin family. But even more important is the deep and lasting influence of the loving blessing energy from Master's presence in New Zealand! Following Master's lecture in Auckland, fellow practitioners went to Hato Petera (St. Peter's) College to visit the students who had performed the Maori welcome on the evening of the lecture. The students were extremely impressed by their short encounter with Master. "I love this lady! When will She come back?" was the response of many. Others asked if they could write to Master or visit Her again some time. We brought with us a loving gift from Master: a contribution of $800NZ (about US$ 400) to Hato Petera College, as well as an additional $500NZ for each of the 15 students who had performed the Maori welcome (a total of $7500NZ, or about US$3750). The students were very surprised, and then ecstatic after receiving such an unexpected and generous gift. Many of them cried, showing their sincere appreciation to Master for Her visit and gift. Both the elder who gave the welcome, the Kaumatua Takutai, and Naida Glavish, the lady who had "called" Master into the land of New Zealand, so-to-speak, were also offered a loving gift, as a token of love from Master Ching Hai. As a token of love from Master, a contribution of NZ$9,9,,(about US$4,950)was given to the Maori people, including the 15 students who performed the Maori welcome at Her lecture. The students show their sincere appreciation to Master for Her loving visit and gift.